No. 1-ranked Stony Brook Women’s Lacrosse kept its perfect record intact Saturday night, as the team held off No. 13 Towson at Kenneth P. LaValle Stadium by a final score of 13-8. Senior attacker Kylie Ohlmiller tied her career high with seven goals and recorded one assist, good for a team-high eight points. Ohlmiller scored five of her seven goals in the second half, and this was the sixth straight game with a hat-trick for the senior. Tigers senior midfielder Emily Gillingham scored her third goal of the day to tie the game 7-7 with 13:25 remaining. Gillingham’s goal was the cherry on top of a 6-1 Tiger run that spanned nearly 21 minutes of gameplay and starting with 3:47 left in the first half. That’s when Ohlmiller took the game into her own hands. The senior kick-started a 6-1 run for the Seawolves, scoring five of her team’s six goals during the final 13 minutes of play. Sophomore midfielder Ally Kennedy scored the one other goal during the run, and the Seawolves were able to find their seventh straight victory. Saturday’s game could have been divided into 6-1 runs, occurring three times throughout the contest. Stony Brook opened the game on a 6-1 run, where the duo of Ohlmiller and sophomore attacker Taryn Ohlmiller combined for four of the six goals scored during the run. Taryn Ohlmiller and Kennedy posted the same stat line, each scoring two goals and assisting on two other goals. Redshirt-senior attacker Courtney Murphy added two goals and collected four ground balls. Both Murphy and Kylie Ohlmiller inch closer to NCAA records with each game. Murphy is 18 goals away from breaking Temple alumna Gail Cummings’ record, who scored 289 goals during her career. 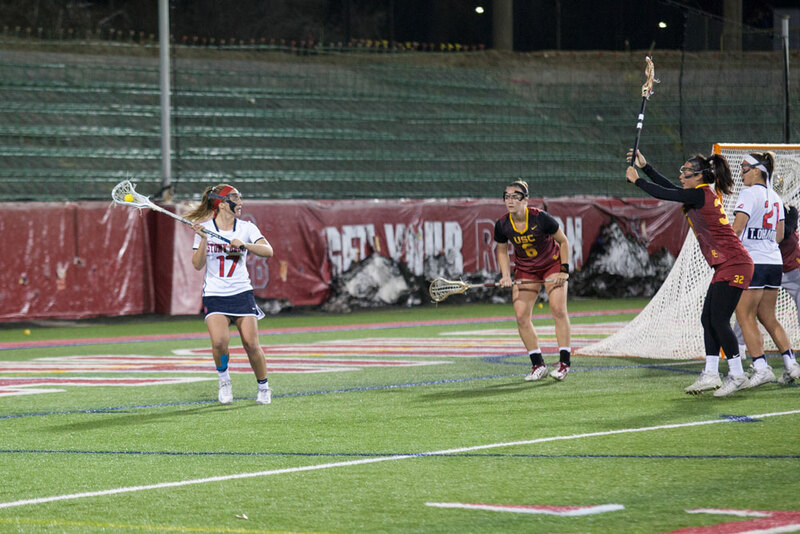 Kylie Ohlmiller has recorded 385 career points and needs 60 more to break the career points record of 445, which is held by Maryland alumna Jen Adams. The senior has collected 191 career assists, and only needs 34 more to break the record set by Northwestern alumna Hannah Nielsen, who recorded 224 assists in her career. Stony Brook outshot Towson 31-17, barely controlling more ground balls by a final tally of 25-23, winning the battle in the draw circle 14-9. The Tigers had 22 turnovers compared to the Seawolves’ 16, and both teams earned 17 clears. Stony Brook will be back on the road next weekend, starting its America East conference schedule. The team will take on UMass Lowell on March 24 at 12 p.m.